February, the shortest month of the year, somehow seemed like the longest. Yet, I’ll keep this post shorter than usual. …because, this too, shall pass. Health woes continue to hug us. We spent the better part of the month being sick. In fact, we slept through our 21st wedding anniversary. We didn’t know what day it was–we were that sick. So grateful for the lovely poem our son wrote for us. It is wonderful to see ourselves through his eyes and it felt like a bit parenting reward. Feb 8 marked eight years of not having my Mom around. Sob, sob. No matter how many lives I have, I want us to be Mom-daughter. I don’t mind if the roles are reversed. As soon as the fevers came down, it was time for my blood tests. The results were not good. I have developed an abscess that won’t heal because of the high blood sugar levels. Instead of moping over it, I understand only I can make the change by being the change. Grateful for my own wisdom! Also, as a diabetic, this will be a part of my life, like it or not and it is up to me to manage it. I am grateful I can smile through it and have a partner who can guffaw through it. And a doctor who is incredibly patient and non-judgmental. I am still on the road to recovery, undergoing treatment for the abscess. It will take time. Very inconvenient, but hey, grateful to have access to treatment. Never have I been so grateful to work from home as now. I shudder to think of having to commute and head out to work, especially with the weather already warmer than it ought to be this time of year. Grateful to have a friend help me out with a diet plan focused on managing my blood sugar. We have a lively WhatsApp group with active discussions and the community is encouraging, sharing their own tips. You know who you are and I look forward to our interaction every day. Ah, the upside of being sick—at least after the initial days that are dominated by a headache—is reading. And TV. I am the kind of silly person who enjoys most movies, no matter how nondescript they are. I just get engrossed. Can’t say the same for books though. Hmph! Grateful for both! I’ve been sleeping so much it is crazy. I guess the body looks after itself to an extent. I nap in the afternoons and no more late nights, which I am sure is doing me a world of good. Amazon was a lifesaver. Earlier when my son needed something I would go to the market, buy, pack, go to the post office, have an argument depending on the staff’s mood, and finally send it off via express speedpost, only to have it reach in 15 days. With Amazon, all that is eliminated. So grateful. I even get some of my groceries and other supplies from them now. Lucky and grateful to live in a lovely locality and have my own terrace where I can walk every day, watching the sunset and a variety of birds soar across the sky. Grateful for pleasant evenings spent with my young lady next door who will soon turn one. Nothing like spending time with a baby to keep your heart singing, is there? Work of course has been mostly non-existent this month and that’s okay. Perks of being a freelancer, eh? I’ve not been stressing over anything and focusing on getting better. One of the things I really enjoy is putting together the #WednesdayWisdom posts here. The process itself is uplifting and I am glad I started doing it. How wonderful it is to unearth inspiring stories. And now, it is end-Feb and the buzz around the April A to Z Challenge will start. I am having fun brainstorming with myself about the posts I’ll write during April. Nice feeling. Who cares whether I’ll actually go by plan? The process is the happy part. Last week, Medium wrote to me to inform me I am now a top writer in the inspiration category. How sweet. So that’s it for February. It has been a significant month—anniversaries, sicknesses, healing. Yes, this too shall pass! How has February panned out for you? Do join me for the February Gratitude Circle blog hop with your own posts. Grab the badge, and add your post link to the linky below. Thank you. My heartfelt thanks to each one of you participating in the Gratitude Circle. You’ve no idea how happy I feel to read your posts. Thank you! Hottieeeeeeeeeeeeee! You HAD to be the top writer in the Inspiration category. Aren’t you amazing? You have no idea how much you inspire me day after day. I love your #WednesdayWisdom posts and the images you conjure up for them. Absolutely love it! I’ll be writing my Action Replay and Gratitude post towards the end of the month, will come back and link it then. I hope the abscess heals soon and I’m glad that the terrible bout of flu is now gone. That really had me worried. Another inspiring post vidya, admire how you come up with beautiful expressions of gratitude, loved the image, hope you are getting better. my prayers for your speedy recovery. so nice to hear about you being on the top inspiration category, congratulations to you, you are very hard working and it reflects in your posts, love and hugs to you vidya. 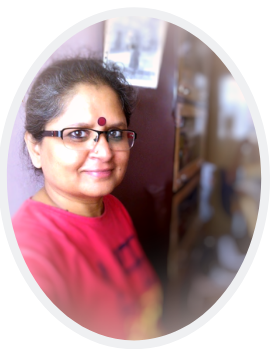 Congrats for being top writer on medium, you are an inspiration for me, love to read your posts regularly. Wishing you get well soon. 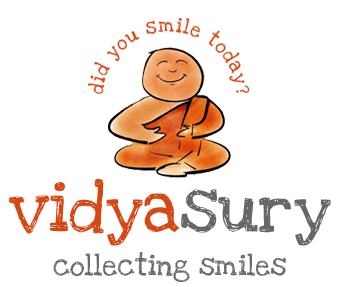 Keep collecting smiles always!. Happy blogging. I have been wanting to link up with the gratitude circle since forever. Definitely posting soon. This too shall pass, is a quote that I use often. Good days go but so bad ones, and that’s a happy thought. Yes, everything is temporary… be it pain or anything else. Been following your Instagram posts…most of it is about food…hence the high sugar levels…in fact all those pictures and recipes scare me. Not that I follow any diet regime but I do restrain myself most of the time. Expect you to be blogging for a long time…forever! Thank you for the lovely wish! By the way, I don’t eat all the food I post in the photos. When I go out, I click photos of food because it looks delicious. I follow a healthy diet. The sugar has been because of medication and perhaps not eating properly. But then, was sick… and now recovering. So I expect to balance it all off. I would love to blog forever, too! Wow congrats on being featured in Business Insider. I love reading your gratitude posts( and that reminds me I need to put mine too) . They put a smile on my face. Would be following your Wednesday Wisdom to soak all the inspiration it gives. It’s amazing how you can focus on the positives always. Cheers to all the kudos coming your way. I do do hope you get better soon. I think our health is something we should never take for granted. You take care. Sending lots of love and healing vibes. You are amazing writer. I loved your concept on gratitude circle. Do take care of your health. I always so admire your positivity, Vidya. I know I have said this before but each time I read your gratitude posts it fills me with a calm and perspective. February was rough for you and I am worried about your health. I am such a worries so no point in telling me not to worry. Haven’t been doing too well on the health front as well but am better now and hoping that one month will go when I won’t be sick. Do take extra care of yourself and Sury. I can so understand about your mum. What an amazing woman she has raised. It makes me respect her even more. And congrats on all your achievements. I feel so happy for you. Your writing is so inspiring, no wonder then that you win accolades for that. Take care and hugs. I am so sorry to hear of all the health concerns, Vidya. I can’t imagine how it must have been, being in and out of hospital, with all those tests! Hope and Sury feel better real soon and the abscess heals as well. Glad you’ve got a supportive diet group. I saw that post on Business Insider and was smiling widely at the feature! Congratulations. Looking forward to your A to Z posts eagerly. With exams coming up for Gy in March, I really have to start cracking on my posts soon. Also, thank you, yet again, for the Gratitude Circle which you put up so diligently each month. It’s inspiring and wonderful. I am so sorry that you and your husband have been so sick. It is never fun to be that ill but when one has diabetes it must be even more difficult because you need to eat but that is the last thing you wanted to do when you were so ill. The best thing is do8ng what you are doing because you are making sure you stick to your diet and check your sugar levels but also going to the doctor. I sometimes say to people, this too, shall pass, like a kidney stone, but it will pass. Glad you are mending and finding the good in a difficult situation. I have learned, as you state here, there is always good – even if it’s online shopping! 🙂 – if you look for it. Thank you for sharing this treasure! Glad to know that you post on Medium. Is it the same blog or another blog ? Hope your March is happy. Wishing you a wonderful March, too! Vidya Sury recently posted…I binge-watched Amazon Prime Original Breathe. Did you? Oh, Vidya! As I read this post, I wondered why I even asked you about the classmate books. 😑 Sorry. Those can definitely wait. Looks like the month was to keep things off your mind and focus on one bite at a time. I am sure your abscess will heal soon. I love your Wednesday Wisdom posts. They are my inspiration and I am sure that’s why Medium has found you inspiring too. I read whenever I get time to read and I squeeze time for Wednesday Wisdom and gratitude posts. Hugs to you on the diabetic diets and the tips. My MIL is a diabetic for 34 years now and the story of her diagnosis, treatment and daily care makes me wonder how she accepts it and looks forward to a brighter morning everyday. It is nice to know you are following good diet plans. Things are going to get better. Hugs, once again. Sorry for your health concerns and my belated wishes for your 21st anniversary. Congrats on your achievements in writing front. Loved the last quote. Nothing is permanent Good/bad. Gratitude and faith has immense power! February was a blank canvas for me and family having no job from the past 7 months.My alumni’s constant assistance and my mother and sisters help worked as miracle for me and family.My both son’s cooperated just like anything without getting effected with situation since me and husband we both were struggling for job. Got few word of mouth references and started working from home on few Training. I am a peaceful n divine soul,each and every moment guided by Lord! Hugs! The health issues should go away now. It’s time! Congrats on the feature – both on Medium and the Business Insider. So well deserved. As I was reading your post – I found similarities with sleep being the major one for both of us 🙂 Thank you for this post and a reminder that good or bad, nothing stays the same forever. Wishing you the best of March and hope it brings better days for you. So sorry that you’re still challenged with health issues Vidya…but with your amazing attitude I don’t think they will be able to stick around for very long! I learned the mantra, “this too shall pass,” when my children were babies and toddlers. Just when you think you can’t take it anymore, things change. So happy to hear that you’re healing and have plans to get and stay healthier! And congratulations on your recent accolades. You’ve accomplished an unbelievable amount over the years. Persistence pays off – along with having fun in the process! Big hugs!! What a month, Vidya. Sending you so much love and healing vibes too. I’m glad you had some good news in addition to all the challenges. Your gratitude list inspires me to no end!!!! This mantra has helped me on many occasions too! You deserve to be the top writer in the inspiring category. Life without Mom is difficult. I lost mine 21 years back and I can completely empathise with you. Blood sugar is a horrible disease that can create havoc in a person’s life..do take care and go for natural healing. Salute your indomitable spirit. You truly are an inspiration to so many of us. I sincerely pray that you feel better soonest. A mother’s loss can be replaced by nothing in this whole wide universe. I lost mine just a month back. The pain dulls but never goes away. Big hugs to you. I guess you are already treading the road to recovery and this month of healing and recovery will spill over to a blessed, magical March for you. Here’s wishing you loads of love and luck in all your endeavours. And Congrats on all those incredible feathers on your cap. Thanks for the burst of positivity and sunshine. I needed that today! Aww hugs for the ill health Vidya; your positivie attitude to work towards curing it is amazing and I salute you for it. SO often we become grumpy over ill health and frustrated as things dont move at the [ace we want it to! I hope you get better soon. I had written a post on “This too shall pass” and your post reminded me of that. So many downs that come in life but generally are balanced with the ups which seem infrequent and less but are actually the same or even more! Its the Universe’s way of keeping us on our toes and ensuring we are on our path. No surprises there that you aced Medium on the inspiration front- you are just fabulous with these posts and I look forward to reading them as they connect with me so well and make me think about stuff in a new light! Wow! You have shown so much strength in fighting with your ailment. More power to you. Ah yes I know about that peek of being physically unwell – reading. Happy to have found this gratitude circle. May you be well soon sooner soonets dear Vidya! And thank you so so much for always inspiring me to raise my positive vibes. Happy to read your gratitude list. Congrats on being the top writer on Medium.I have to also try Medium. I can’t even begin to tell you how much you inspire me. After the month you had, anyone would be hard-pressed to find something to be grateful about, and yet you found so many things. I hope things get better on the health front. It’s always a bummer when you aren’t feeling 100%. Having said that, yeah I do use sickness as an excuse to catch up on books and TV guilt free. 😛 And yes, like you, I am more forgiving with TV than I am with books. Possibly because I invest more of time and my mental energies in a book.